One of our most cherished and accomplished colleagues, William R. Dickinson, died in his sleep on July 21, 2015 in Nuku’alofa, Tonga, where he was conducting field work. Bill was not only an incredibly accomplished scientist of astounding breadth and depth, but also one of the most engaging, encouraging, and inspiring figures our field has seen. In this video interview made in 2014, Bill Dickinson shared his methods of investigation and his love for science. 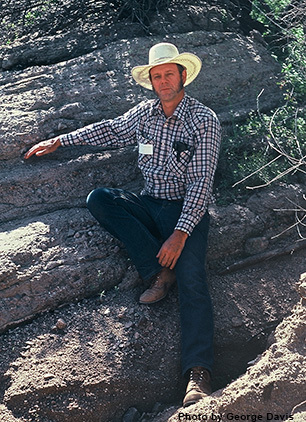 If you would like to post something on the Geosciences tribute page about Bill, please email your post to alicias email.arizona.edu. Announcement: A celebration of the lives and professional accomplishments of Bill and Jackie Dickinson: October 23, 2015. 3:00 - 6:30 pm, Kuiper Space Sciences Building.